Best-selling author Tom Clancy died last October at age 66, but his best-known creation, CIA analyst turned action hero Jack Ryan, continues to cheat death and turn back the clock. 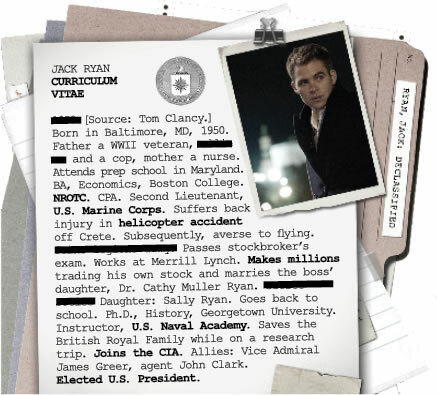 He’s young again in JACK RYAN: SHADOW RECRUIT, the Ryan re-boot from Paramount opening January 17. 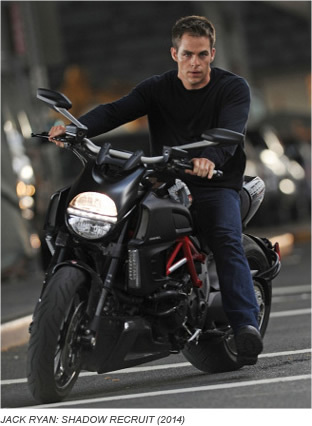 Not based directly on any Clancy novel, the new film stars Chris Pine (STAR TREK, UNSTOPPABLE). Pine and director Kenneth Branagh, who also plays the film’s villain, have been given something of a clean slate to re-imagine Ryan for a new generation of geo-political thrill-seekers. Pine, 34, who portrayed Captain James T. Kirk in the last two STAR TREK films, has boldly gone where no one but William Shatner has gone before, and as Jack Ryan, he’s following in the footsteps of three more of Hollywood’s best-loved leading men: Alec Baldwin, Harrison Ford and Ben Affleck. Each put his stamp on the role in four previous films. Unfamiliar with the character? Relax. We’ve prepared a dossier for you. 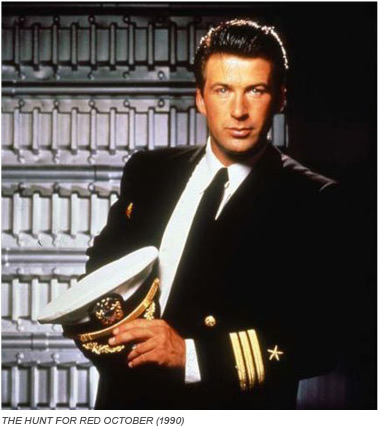 Jack Ryan first appears in Tom Clancy’s 1984 debut novel, “The Hunt for Red October,” a favorite of President Ronald Reagan in which a Soviet nuclear submarine is headed for the U.S. Before America can respond, the military brain trust must determine whether this is an attack or, as Ryan believes, a defection. 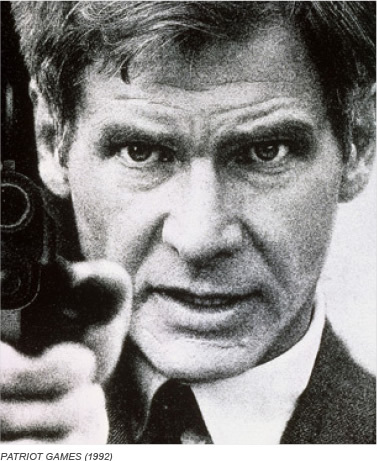 Tellingly, Washington Post critic Reid Beddow never even mentions Jack Ryan in his glowing review of the book. The character is overshadowed by Clancy’s propulsive cold war plot and impressive knowledge of arcane submarine and weapons technology. Perhaps the signature moment in Baldwin’s portrayal of Ryan occurs early in the film, when the analyst, summoned to a White House briefing by his mentor, Admiral Greer (James Earl Jones) realizes what the soviet submarine captain Ramius (Sean Connery) is up to and disrupts the meeting with an outburst. The moment paints Ryan as brilliant yet immature and utterly heedless of bureaucratic considerations. 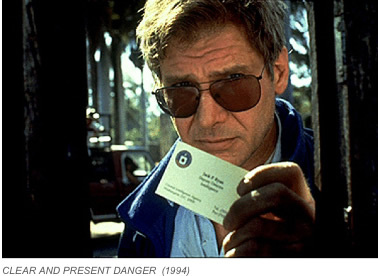 Harrison Ford turned 50 the year PATRIOT GAMES (1992) was released. The second Ryan film, directed by Australian Philip Noyce (DEAD CALM) emphasized the character’s home life, including his wife, Dr. Cathy Ryan, an ophthalmic surgeon played by Anne Archer (Gates McFadden did the honors in THE HUNT FOR RED OCTOBER) and daughter Sally – both threatened by IRA terrorists. Ford reprised the role in 1994 for Ryan’s next adventure, which involved a clandestine U.S. war against a Columbian drug cartel. This time, the one seeking vigilante justice is the dissembling President of the United States played by Donald Moffat. But Ryan, now deputy director of the CIA, still has plenty to feel righteously angry about. He finds himself undermined by corrupt politicians at home and under fire in the field where he teams with CIA operative John Clark (Willem Dafoe) to rescue imprisoned American soldiers who have been abandoned by their government. Clark, the Bond/Bourne yin to Ryan’s scholarly yang, would turn up in the next Ryan film played by Liev Schreiber. 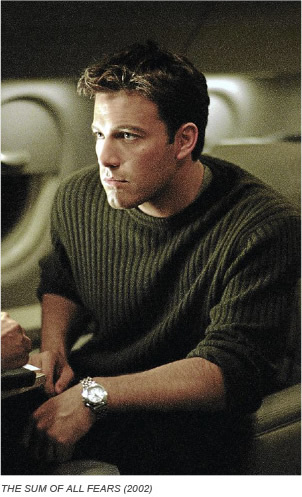 Ben Affleck (ARGO, GOOD WILL HUNTING), then 32, had a tougher time of it with the critics when he played an even younger Jack Ryan in THE SUM OF ALL FEARS (2002). The plot features a Russian splinter group that nukes a football game in Ryan’s hometown of Baltimore. The critics bombed Affleck’s performance in much the same way. Of course, Affleck had the last laugh. A decade after those reviews came out, in his subsequent CIA assignment as Tony Mendez, the ex-filtration specialist in ARGO (2012), the producer/director/actor proved there is life after Ryan when his movie won the Oscar® for Best Picture. The new Ryan film centers on a Russian plot to destroy the U.S. economy with a terrorist attack. This time, Ryan’s wife is played by Keira Knightley, who, in a break from Clancy tradition, travels to Moscow to get in the thick of the action with her husband rather than fretting about him from the sidelines as a symbol of the home front. “You’re not just an analyst any more, Jack, you’re operational,” says William Harper, CIA (Kevin Costner) to Ryan, proving once again that the more things change, the more they stay the same. That leap from desk jockey to action hero has always defined Jack Ryan and it’s likely to be the standard by which Chris Pine’s performance is judged when JACK RYAN: SHADOW RECRUIT is released nationwide.